Tall booklet style wedding program. 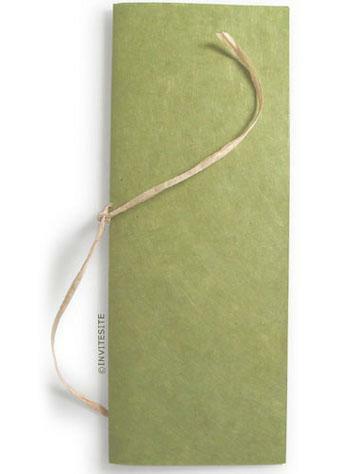 Cover made from apple green tree-free lokta paper from Nepal. This lokta sheet is imprintable - you can print your names and date on the front cover with an oversized printer. Print Your Ceremony Information on mulitple sheets of 70 lb 100% post-consumer recycled milkweed paper (standard 8.5x11 inches). Inside sheets can also be printed on both sides. Bound with a length of natural paper raffia. We allocate 1 yard (36 inches) per program. Overlay:imprintable handmade green lokta paper.